Taste test: These are unusual potato chips in a number of ways. 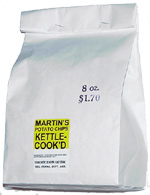 Let's start with the bag they come in: It's just an ordinary white wax paper bag, held closed by two staples, with a sticker on it that identifies these as Martin's chips. That's strange. When you open the bag, the aroma is unlike any other chip I've ever smelled — they smell like powdered donuts. And although these are kettle chips, they're nothing like Cape Cod chips. They don't taste all that potatoey — in fact, they taste kind of like powdered donuts too. And they have a much different texture than Cape Cod chips. Smell test: Smells like powdered donuts. This snack was discovered by Rick at Erie, Pennsylvania.